It's an extraordinary scene: Tens of thousands of people pouring into the streets of a Chinese city, demanding the right to elect a leader of their choosing. Yet that's what happened this week in Hong Kong -- a former British colony that rose to prominence as a trade hub and gateway to China. Since it was returned to Beijing in 1997, the territory has been ruled under the principle of "one country, two systems," transforming itself along the way into a global financial hub. Many Hong Kongers hope Beijing will drop a proposal to screen all candidates for the city's top office. Protesters and Hong Kong officials are due to meet for talks soon. But what's so special about this city that is often ranked as one of the best places to do business? 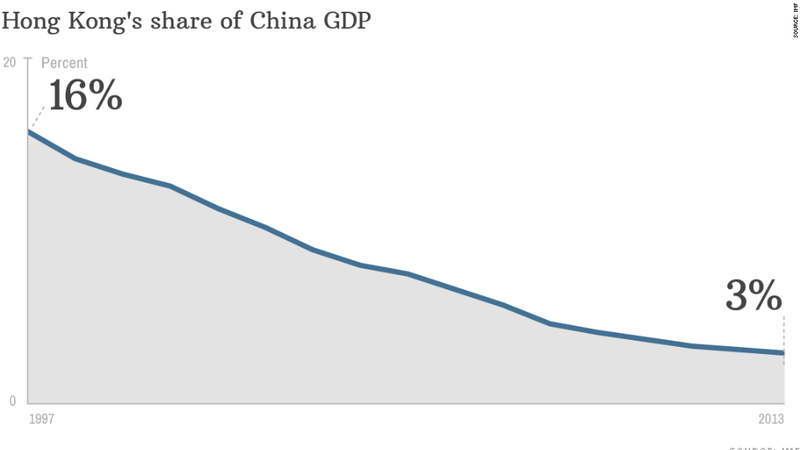 And why does the standoff matter to the world economy? The city's stock exchange is the second biggest in Asia after Tokyo. The companies listed on its main board are worth a whopping $3.1 trillion. While that's a lot of money, even more important is the role the market plays in allowing companies from mainland China to raise cash, matching them up with foreign investors who want to profit from the world's second biggest economy. 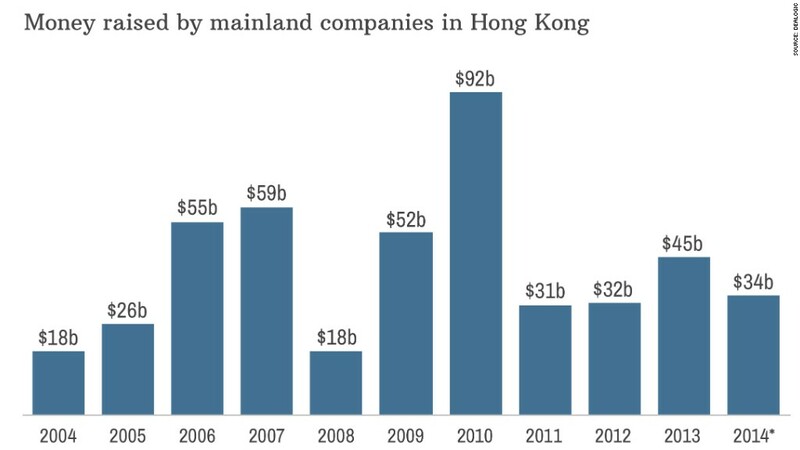 Last year, those companies raised $45.3 billion in Hong Kong, including 45 separate IPOs. And despite the trail blazed by Alibaba (BABA) to New York last month, Hong Kong remains the only place where that exchange happens regularly on a large scale. Hong Kong has only 7 million residents, but is ranked 10th in the world in terms of exports. That's 2.7% of the world's total export trade -- not shabby for a territory that covers an area slightly larger than New York's five boroughs. The city's massive container port is always humming, and countries with half the world's population are within five hours' flying time. As the chart above shows, Hong Kong's star has dimmed over the past two decades when compared to the rapid growth that turned China into a global power. Hong Kong's real significance these days is in the services and stability it offers multinational companies and China itself. China is the world's second largest recipient of foreign direct investment, and nearly two-thirds of that flows through Hong Kong. One major selling point is Hong Kong's ironclad rule of law and its independent judiciary. Businesses place an enormous amount of faith in the city's ability to resolve disputes fairly. They have no such faith in China's courts. Hong Kong also plays a valuable role in China's efforts to promote the yuan as a trusted -- and traded -- currency. The city has a thriving market, for example, for bonds denominated in yuan. 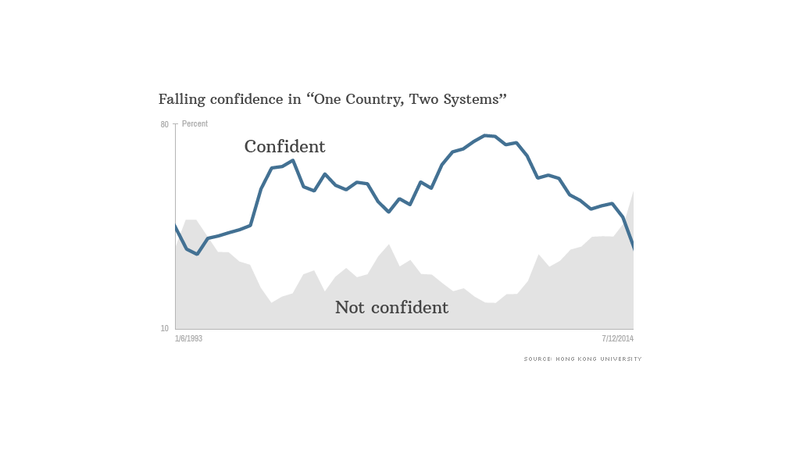 Despite the close ties between the kissing cousins, more than 56% of Hong Kong residents have lost confidence in the "one country, two systems" arrangement that provides the basis for Beijing rule. As recently as 2007, nearly 80% of residents said they were confident in the deal struck between China and the U.K. The issue drawing most attention at present is the procedure for selecting Hong Kong's chief executive. But there are other signs of fissure: Many Hong Kong residents are upset over rising property prices fueled by mainland buyers, and their consumption of social services. If relations were to become even more strained, Hong Kong and China will pay a high price.